The first step was to wash and sanitize a large pot, two molds, and various spoons. I used Star-San, but any sanitizer suitable for brewing would work here as well (Iodophor was actually developed for the dairy industry). For two small rounds of Camembert I used 1 gallon of whole milk, in my case just a standard supermarket jug (the rawer the better though). 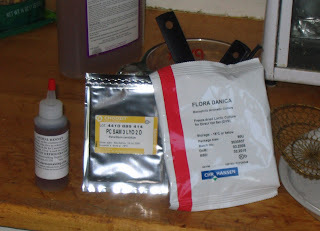 Here are the three oddball ingredients, from left to right: rennet (an enzyme that curdles milk proteins), Penicillium candidum (the classic white mold), and Flora Danica (a blend of different acid and CO2 producing bacteria, including Streptococcous lactis, S. cremoris, S. lactis biovar diacetylactis, and S. cremoris). 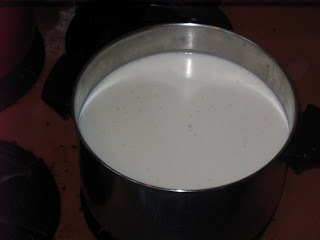 I heated the 1 gallon of milk to 90 degrees on the stove. I then added 1/4 tsp of the Flora Danica and 1/32 tsp of the Penicillium candidum (eyeballed). It takes a bit of time for these cultures to dissolve so I stirred gently for a few minutes (you want to be gentle as oxygen is not good for lactic acid producing bacteria). I held the milk at 90 degrees for 90 minutes, during this time the Flora Danica feeds on the milk sugars creating lactic acid which in turn lowers the pH of the milk. This step is necessary for the rennet to curdle the milk proteins properly. I then added 1/8 tsp of rennet which I had diluted in 2 tbls of filtered water. After stirring in the rennet I let it sit for 60 minutes still at 90 degrees. After the curd left clean cut marks I cut the curd in a 1/2 inch checkerboard pattern and let sit for another 30 minutes. The curd was very delicate so I skipped the 15 minutes of stirring Home Cheese Making. I scooped the curd into the two round plastic molds positioned on two sushi mats. The whey drained quickly forcing me to pour off the excess that dripped through the mat onto the plate below. After the cheese seemed relatively solid (3 hours) I flipped it over and left it to drain another 2 hours. Took the molds off and added a light covering of kosher salt. Waited 10 minutes, then put into my chest freezer at 45 degrees, DampRid in the bottom to stop it from getting too humid. The cheese will stay at 45 for the next two weeks while it develops the classic white mold rind. After the mold develops I'll wrap the two rounds in a cheese wrap and give them another 2-3 weeks to ripen at 45 before eating. At this point I am much happier with this recipe from Home Cheese Making than I was with the one for provolone. That said I had to drop the step that called to stir the curd for 15 minutes, I am beginning to suspect that maybe I need to add more rennet than the recipes call for. I love the cheese posts! Any tips for keeping the milk at 90F? 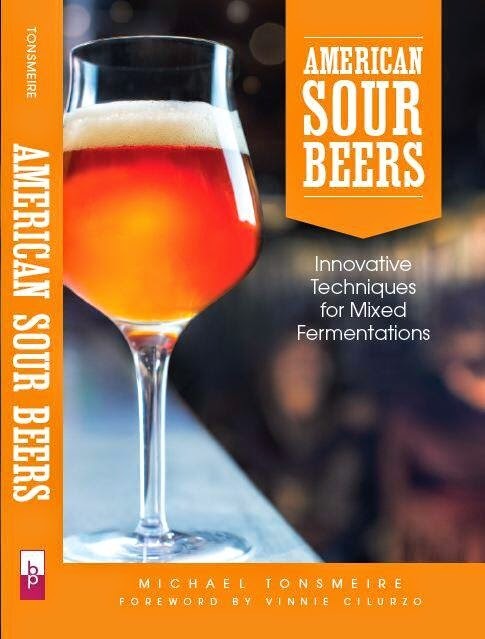 Where did you get the cultures? I happened to be using the oven set to 250 to do a spicy-beer-braised-brisket, and that was enough to keep the temp of the milk on the stove top right around 90. A hot water bath (hot tap water should be enough for a cheese like this) would be another good option. Mike - have you ever tried anything with Chevre and are you aware of a place in the city to get goat milk to make it with? My girlfriend and I would like to try cheesemaking and we are debating what kinds to start with. I made goat yogurt with milk from Whole Foods on Wisconsin Ave. I’m not sure if it is a standard item there or if other Whole Foods get it, but that would be a good place to start. 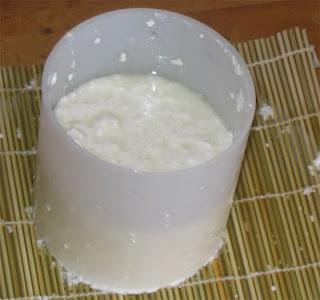 I am thinking of doing a goat’s milk Camembert for my next cheese, although I’m not sure when I will get around to it. If you are getting a curd that is too soft, you might try adding calcium chloride at the same volume as your rennet (or 1/4ts per gal of milk). Also, avoid store bought "ultra pasteurized" milk, which will simply not work well for cheese making.